Police interviewed you in March 2014 - did they ever explain why they waited so long? asks McConnell. No, says Holly. No redirect by Crown prosecutor Jill Knee. Holly is excused. Court breaks for lunch. Dennis #Oland murder retrial is back in session. Crown prosecutor P.J. Veniot advises the court there will be a province-wide test of the Alert Ready system at 1:55 p.m. Even if cellphones are on silent, it could disrupt proceedings, he says. Horgan is retired now but was in the department’s canine unit at the time of the murder and was involved in the hunt for a murder weapon and other evidence around the scene of Oland’s office building. Justice Terrence Morrison wasn't aware, but knew there was "kind of a misfire" during the last test in August. We'll see if it works this time if everybody jumps, he jokes. Crown prosecutor Jill Knee is interviewing retired dog handler, Const. Mike Horgan. Horgan says he and the dog travelled the entire perimeter of the alley and then cross crossed back and forth as the dog attempted to pick up any human scent. Nothing was detected after 20 or 25 minutes says Horgan. "Do you have a pointer by chance?" asks Horgan, seeing what the squiggly lines of his finger tracing of his route looks like on the display screen. No. His marked route is being printed off in the courtroom and marked as an exhibit. Horgan was also involved in a later search in Rothesay near the Renforth Wharf where Dennis had gone after leaving his father’s office. Nothing was found there either. 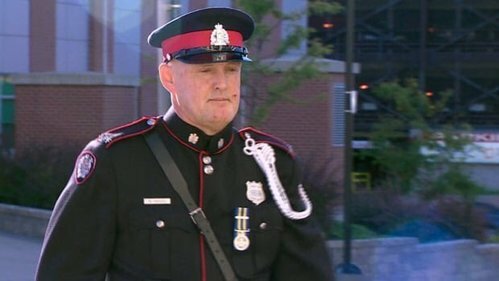 The following day, Horgan was off duty but received a call from acting Sgt. Miller at 1:15 p.m. Horgan then called head of major crime unit Sgt. Dave Brooker. As a result of that, he attended Renforth wharf to conduct a search, he says. Horgan says he was also involved in a search of the grounds around Dennis Oland’s home a week after Richard Oland’s body was found. Nothing found there either. Nothing found there either, he says. On July 14, Horgan was also involved in a search of Dennis Oland's home at 58 Gondola Point Rd. in Rothesay. About 20 officers participated, he says. Horgan is the sixth SJ police officer to testify so far. Now being cross examined by defence lawyer Michael Lacy. How long did you search Dennis Oland’s yard? About 4 hours. 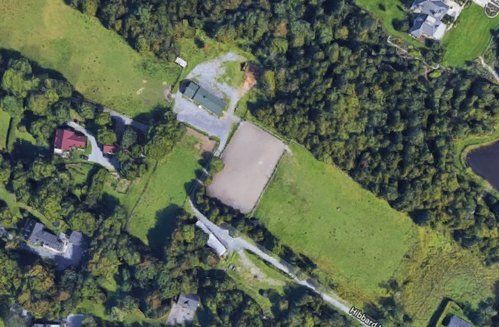 “It’s quite a large property,” says Horgan. 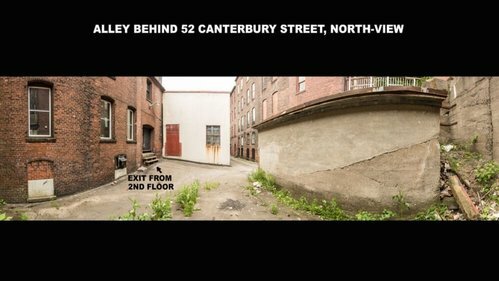 Of the 3 searches he conducted, the only other area he couldn't search was an "elevated area" in the alleyway behind 52 Canterbury St. because he couldn't access it with his dog, he says. Horgan says actual search time with his dog Leo at the Oland home was 2 hours. It was hot that day so the dog was rested for a bit and some time was taken up organizing for the day. Defence lawyer Michael Lacy handling cross-examination of Horgan. Asks how much time he spent searching the grounds of Dennis Oland's home on July 14. About 2 hours total - 12:25 p.m - 1:25 pm, then a break for dog Leo because it was such a hot day, then 2 p.m. - 3 p.m. 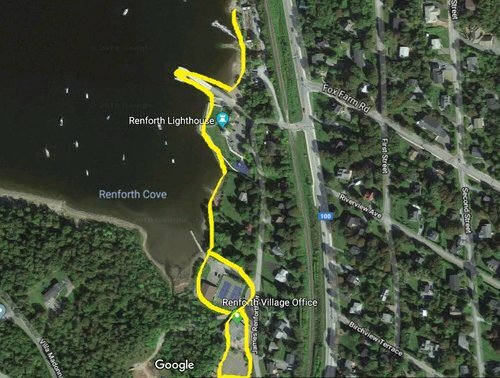 The search around the Renforth wharf - were you told to look for a murder weapon? No. No one specifically mentioned murder weapon - just that it was an evidence search in relation to Richard Oland’s murder. Horgan says he searched 3-5:45 p.m. that day. Very extensive search? asks Lacy. We covered a lot of area, says Horgan. Wasn't as hot that day and it was later in the day so the dog didn't need the same kind of break, he says. Lacy taking Horgan through a detailed account of where he searched in Renforth on July 8, 2011. Showing aerial and ground pictures of the wharf and lighthouse and other locations Horgan and his dog Leo travelled that day. Lacy asks if Horgan was instructed to search for a murder weapon. Was never told about a murder weapon, was told to search the area, replies Horgan. You were "just left to your own devices to determine what you were searching for?" asks Lacy. "Just basically an evidence search, that’s what I was told," says Horgan. But evidence search related to what you knew at that time was being treated as a homicide? presses Lacy. Yes. Moving on to the first search outside Oland’s office building on July 7, 2011. If a killer other than Dennis had fled out the back door stained with Richard Oland’s blood as has been suggested Horgan’s dog was unable to detect it. #Oland trial is on afternoon recess. Forensic Sgt. Mark Smith is waiting in the hallway. Lacy asking about a low rise garage in the alley that Horgan and his dog Leo did not search. “I couldn’t get the dog up there,” said Horgan about the flat roof of the garage. You didn't ask another officer to come and search that area? asks Lacy. No. Lacy asks about an area behind the garage accessible from the garage roof that also wasn’t searched. The area eventually leads out to Germain Street. 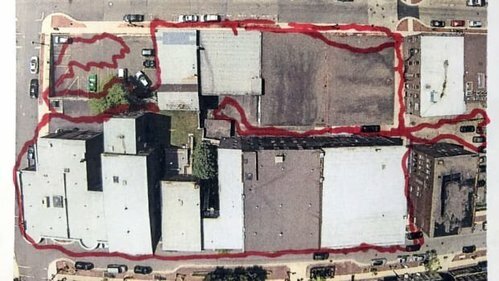 Defence killer could have pulled him/herself up on the garage and escaped to Germain using unsearched route. 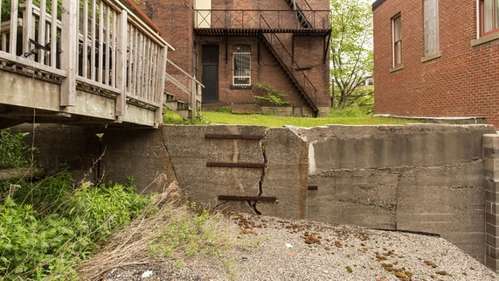 “There is a path one could take and exit on Germain Street,” says Lacy. Lacy plays a video made by the defence of someone coming out the back door into the alley and climbing up on the garage and walking to Germain. It certainly wasn’t practical to do that with a dog, but it certainly would have been possible without a dog, correct? asks Lacy. Horgan agrees. Lawyers finish questioning Horgan earlier than expected. Trial adjourns for the day. Resumes tomorrow at 9:30 a.m.